Outback's new Radian inverter works equally well as a grid tie or off-grid inverter. There are two separate AC inputs, one for the bi-directional grid connection and one for a back-up generator. There is a built-in 50 A transfer switch at 120/240 VAC. The output is 120/240 VAC split phase in each unit for easy tie-in to US standard wiring and grid connections. 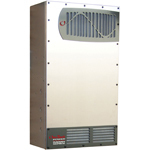 The Radian features 8kW of continuous output power and can support large dynamic load variations and surge loads, making it well-suited for demanding commercial applications as well as residential use. With two power stages, it is able to provide high efficiency and redundancy for critical applications, and the modular design is field serviceable. 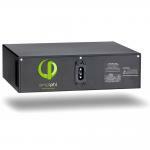 The Radian can be parallel stacked with up to 10 inverters for 80kW total output. The Radian also has auxiliary controls which include a contact closure, a 12 VDC output signal and terminals for a remote on/off switch. 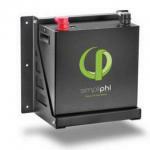 The inverter comes with a standard 5-year warranty. An optional 10-year extended warranty is available where required by state incentive programs. The Radian is for indoor use only. Dimensions are 28"H x 16"W x 8.7"D. Weight is 125 lbs. Listed to UL 1741 for U.S. and Canada.